Christie’s invited me to write an introduction to the sale catalogue of my father’s art from my collection, which goes on the block next Tuesday, 18th March; coincidentally, my mother’s centenary birthday. It was surprisingly easy to write. Although after I had sent in the final draft that would go to the printers I felt highly emotional, and continue to feel as if everything that was kept hidden is finally rising to the surface. 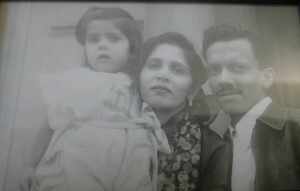 For so long, my mother was the invisible person in my father’s history. To know that at last she is visible to the world at large has also made me visible in some strange way, which could not have been predicted beforehand.